Workshops, games, crafts, and activities to simplify circle time, naptime, transitions, getting dressed and other daily routines with young children. A picture game, activity sheets, an attendance chart, posters, and decorations that can easily be integrated into your many routines. In the Educatall club, you will find numerous printable documents that can help you on a daily basis such as a task train, posters, a visual routine, motivational charts, etc. Use these tools to encourage children to participate in routines and to help them develop their autonomy. (Open thematic poster-Routines) Print, laminate, and display all kinds of posters. 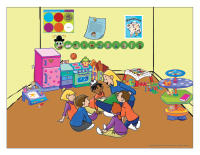 Visit the Educatall club and pick various posters or tools that you feel will be useful for the children in your group. 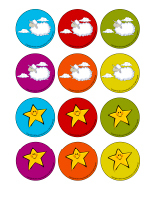 Print them and use them to decorate your daycare and simplify various tasks and activities. Each day, select one tool you wish to make a part of your routine. Once you feel children are comfortable with this tool, introduce another one. Among many other documents, children are sure to appreciate the toothbrushing chart, workshop posters, our visual routine, etc. This is the perfect time of the year to visit the Educatall club's archives. Sit with your group and explain the various tools you will use as part of your daily routine. We have prepared a visual routine that includes greeting children in the morning, snack time, free play, naptime, lunch, saying goodbye at the end of the day, etc. 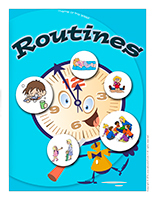 (Open tools-visual routine) Present the illustrations to your group during circle time and have fun placing the various routines in the order in which they occur during the day. 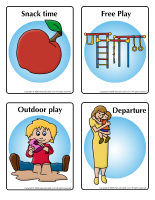 (Open picture game-Routines) Use the pictures to decorate your daycare or to spark a conversation with your group. 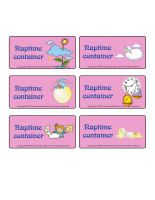 Print, laminate, and store the pictures in a Ziploc bag or in your thematic bin. (Open activity sheets-Routines) Print and follow instructions. 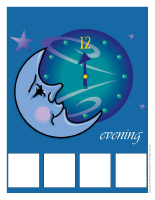 (Open writing activities-R like routine) Print for each child or laminate for use with a dry-erase marker. Blocks of all kinds: Lego, wooden (natural), Bristle, Duplo, Mobilo, etc. Cardboard boxes stuffed with newspaper to create giant blocks. Means of transportation: cars, trucks, airplanes, boats, trains, etc. A toy garage, a toy car mat, cardboard cylinders to represent tunnels, and traffic signs. Farm animals, zoo animals, reptiles, pets, etc. Construction materials found in nature: branches, rocks, pieces of bark, etc. An easel and large pieces of white paper for painting. Paintbrushes in different shapes and sizes, sponges, rollers, old toothbrushes, etc. Finger paint and glossy paper. Regular and fancy (scrapbooking) scissors. Glue sticks, white glue, glitter glue. Feathers, pompoms, pipe cleaners, yarn, confetti, ribbon. Construction paper in every color. Cellophane, tissue, and wrapping paper. Paper plates, cardboard tubes, cone-shaped drinking glasses. A tablecloth to protect your table. Coloring pages related to routines, workshops, friends, your group's name, etc. Everything you can find that children can use to dress up. Adult and children's clothing, handbags, shoes, belts, scarves, hats, and old jewellery. Appliances (toy versions or real ones with the electrical cord removed), plastic dishes, a table and chairs, plastic food items, empty food containers. Dolls, doll clothes, a small bed, a high chair. Back to school-themed memory game using educatall.com's picture game. Modeling dough and cookie cutters. Necklace beads in a variety of shapes, sizes, and colors. Toys involving shoelaces, buttons, zippers, etc. Toys requiring assembly or involving parts that fit inside each other or can be stacked. Lotto game, memory game, and a variety of board games adapted to the ages of the children in your group. Card games, magnetic letters and numbers. Magnets of all kinds with baking sheets. Fairy tales, storybooks, picture books. Book and CD sets with headphones. A photo album filled with pictures of the children in your group. Magazines containing lots of pictures. Felt board with figurines for creating stories. Comfortable chairs, cushions, a small table. Posters to decorate your walls. A small "hideout" area for those in need of quiet time. A whiteboard and dry-erase markers. o	You can replace the sand or water with lentils, oats, dry pasta, sunflower seeds, cotton balls, leaves, dried peas, cereal, etc. Consider the ages of the children in your group before choosing what you will offer. Funnels, empty containers for filling and emptying. Tiny objects or figurines that can be hidden. Kitchen utensils for stirring the contents of your bin. Objects that float and others that sink. Pictures of animals and natural phemomena. A map, an atlas, a globe. Plants, dirt, a vivarium, an aquarium, gardening tools. Magnifying glasses and plastic gloves. Objects found in nature (branches, leaves, pinecones, rocks, etc.). Containers of all kinds for creating mixtures. A tape recorder and a microphone children can use to record themselves. Music from different countries or various musical styles. Musical instruments (real or toy versions). Rhythmic sticks, triangles, drums, cymbals, a xylophone, bells, sand blocks, etc. Be sure to say hello to each child as he/she arrives. Avoid long conversations with parents. (Open attendance chart) Print and laminate. 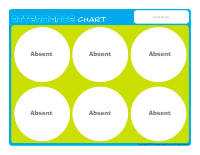 Display the attendance chart close to your daycare entrance or on the door. As children arrive, they can, with their parent's help, position their label on the chart to indicate they have arrived. (Open days of the week) Print, laminate, and cut out. 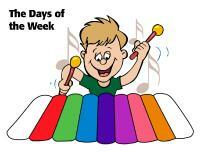 Children can associate each day to the piano by matching the colors. Draw a large circle on the floor (use chalk or electrical tape). Add the first letter of each child's name next to his/her spot. 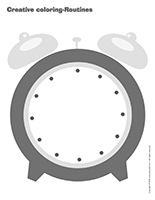 Provide stickers children can use to decorate their circle time spot. This will make it easier for them to recognize where they are to sit during circle time. Use different stickers depending on your theme or the season. For example, use snowflakes during winter, hearts around Valentine's Day, etc. Depending on the ages of the children in your group, you may also choose to use a number, a symbol, a shape, an animal, or a color to identify each child's spot. Encourage each child to pick a sound. 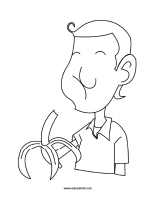 When you are ready, use your mouth to produce each sound to invite children to join you for circle time. Here, the sounds may or may not be related to your current theme. Turn the lights on and off in a rhythmic fashion to signal to your group that it is circle time. If your group is very active, this represents a calm way to let them know they need to stop what they are doing and join you. Have fun using this light signal several times throughout the day to provide children with the opportunity to practice gathering as quickly as possible. (Open routine game) Print, laminate, and cut out. Associate each symbol to the corresponding time of the day: morning, lunch time, afternoon, or evening. Gather in one corner of your daycare. Show children an object they will have to search for. Ask them to turn around while you hide it. The object should be somewhat visible and children should not have to move other items around to find it. When you give the signal, children must search for the object with their hands behind their back or on their head. As soon as a child sees the object, he/she must sit down on his circle time spot. Once all the children have found the object, the game starts all over again. (Open tools-visual routine) Print. 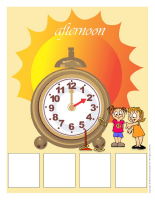 Ask children to place the illustrations in the correct order, according to when they occur during the day. Invent an original rallying cry for your group. Explain to your group when and why you will use it (if they are old enough). Use your group name or your daycare name for inspiration. Every time you call out the first line of your rallying cry, children must complete it and then remain perfectly quiet while you explain the upcoming activity or routine. For example, you could say, "My little mice say..." and your group could complete the cry by making mice sounds. When you are moving from one activity to another, encourage children to move about like different types of animals or to sing songs. Use pictograms as reference points in your hallways to help children respect your rules and requests. For example, you can stick fun illustrations on the railing they are supposed to hold on to as they go up and down stairs. You can also use traffic signs to indicate which way they must go, etc. Children stand single file behind you. They must imitate your every move. If you lean towards the right, children must do the same. If you raise your right arm, they must also raise their right arm, etc. Encourage children to stand single file, holding the waist of the child in front of them to form a train. Announce that the train will be departing shortly. Make train-like sounds with the children in your group. Guide children to a specific area, for example your kitchen area. When you arrive, say, "Stop! We have arrived. This is our kitchen." Invite children to explore the area for a few minutes. Take advantage of the time spent in each area to inform children of the areas they may or may not have access to as well as the rules that must be respected. After a while, children hop back on the train so you can take them to another area. With younger children, help them put a single clothing item on at a time so they don't get too hot. For example, let them try to put their nylon pants on as you help one child. This will help them develop their autonomy. Transition bins can really help keep children quiet during this routine that can sometimes seem to take forever. Show children how they can place their coat upside down in front of their feet, insert their arms, and then pass their coat over their head. They will love this fun technique! (Open winter clothes) Print, laminate, and hang the illustrations in your cloakroom to represent a clothesline. 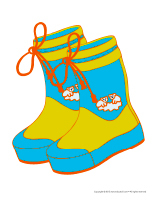 They will help children recognize the correct order for getting dressed to go play outside. (Open hunt and seek-Routines) Print and laminate. Display several different hunt and seek activities on the walls of your cloakroom. Visit the hunt and seek section of the Educatall club. Children who get dressed very quickly can keep busy hunting for the different items in the scenes as they wait for the others to be ready to head outside. Play a game of "Simon says" with your group to help children get dressed. Simply say, "My early childhood educator says..." and complete the sentence suggesting one clothing item at a time. Offer different types of soap. Select different scents and colors to encourage children to want to wash their hands. Colourful facecloths can be used to wash children's hands and face after snacks or at lunch time. Every day, use a special item to make your handwashing routine fun: a sponge, a facecloth, a small brush, etc. Children will look forward to seeing what the daily object is. A plastic puppet can be used to add a touch of humour to these routines. Call children to come wash their hands or brush their teeth one bye one by naming a color they are wearing or a unique characteristic. 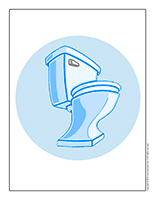 (Open pictures-toilet) (Open pictures-faucet) Print and laminate the pictures. Arrange them on the floor to create a path. Ask children to stand on the illustrations to wait for their turn to wash their hands or brush their teeth. The illustrations can be used to decorate your bathroom too. During your handwashing routine, present a variety of objects children can use to wash their hands: sponges, facecloths, brushes, pretty towels, etc. Purchase several different toothbrushes. Use them to create a fun bin. Children can use the contents of this bin to practice their toothbrushing technique. Create a task chart that regroups the main tasks surrounding snack time and lunch time. A tablecloth, placemats, napkins, candles, etc. All these items can make these routines interesting. Teach children to wait for you to be done eating before they may ask for seconds. Serve meals in a variety of different ways. Pretend you are a waitress in a restaurant, invent fun names for the foods you serve, etc. Adding a drop of food coloring to children's glass of milk will make it possible to invent different "flavors" and encourage them to drink up. 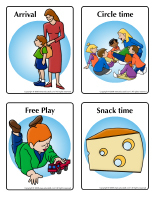 Provide simple games to help children wait for their lunch or snack. Fill several small bins with tiny toys children may use only at snack time or lunch time, and what's more...only if their hands are clean. Provide a wide range of material. Invite children to use the material to create a collage you can later laminate to make placemats. This is a great activity for younger children. Using their placemats will help them remain seated at lunch time. If you wish, you can encourage them to cut food items they like out of grocery store flyers and use them to decorate their placemat. This activity can help you learn which foods children appreciate. Name a "Cleanup inspector" each day. He/she will be responsible for making sure all the toys are put away. Identify bins with pictures or illustrations to simplify cleanup time. Children and other early childhood educators who work in your daycare will know where each item belongs. Make sure your bins are the right size so that toys are easy to put away. You could have a "lost toy bin" for any small parts and accessories that you find. At the end of the day (or week) ask children to try and find which toy or game each part belongs to. When play time is over, ask children to stop what they are doing. Count to 10 before saying "Go!" Children must then rush to pick up all the toys as quickly as possible. Time them and write the result on a board. Encourage them to try to beat their record every time. (Open the task train) Print, laminate, and cut out. Display the train in your circle time area. To distribute tasks, you can, for example, place the pictograms representing the children in your group face down on the floor. Pick one pictogram at a time and let the child it represents pick his/her task. If you prefer, you could also arrange the various task pictograms face down on the floor. Pick one task at a time and invite children to raise their hand if they are interested. You could also play musical ball. The child holding the ball when the music stops gets to pick his/her task. Give each child a plastic bag with handles. Ask them to fill their bag with the toys that are on the floor. When their bag is full, encourage them to return each item to the right spot. Ask children to put all the toys of a specific color away. When they are done, suggest a new color. Have each child put 5 toys away, then 4, then 3, and so on... Continue until all the toys have been picked up. Play a song and tell children that all the toys must be put away before the song ends. Place all the toys children have played with in the centre of your daycare. When you give the signal, children must grab as many toys as they can and rush to put them in the right place. They must continue until all the toys have been put away. 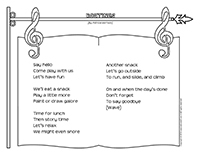 Sing a short song to capture children's attention and inform them that it is story time. Insert your book in a special decorated box used specifically for story time. Use accessories and various items to compliment the story you are reading. Use storybooks, book and CD sets, short movies, etc. (Open Game-This is my spot-Routines) Print and laminate. Arrange the illustrations on the floor to determine each child's spot for story time. Print two copies. Have children pick a picture and sit on the corresponding picture, on the floor. Print several pictures and illustrations from a variety of different themes. Arrange them face down on the floor. Display one illustration at a time. Children must use it as inspiration to invent a story. After a few minutes, display a second illustration and encourage them to continue their story. Prepare for a very silly story! Create a naptime ritual complete with a mascot, magic powder, etc. Calling upon children's imagination will make this routine magical. Stick glow-in-the-dark items on the ceiling and walls in your naptime area. Use different types and colors of lighting depending on your themes. For example, you can purchase fun nightlights. Set a large blanket on the floor. Hold a timer in your hands. Invite children to lie down on the blanket and relax until your timer rings. Encourage them to admire the clouds, listen to the birds and the wind, etc. Show children the difference between breathing in and breathing out. Show them how their tummy gets bigger when they breathe in and smaller when they breathe out. Each child finds a partner. Have them take turns massaging each other. They can, for example, roll a toy car on their partner's back, arms, and legs or gently sweep a feather over their partner's skin. At first, children may laugh a lot, but they will eventually calm down. Show children a few yoga poses or use a relaxation CD with guided instructions. (Open game-This is my spot-Routines) Print two copies and laminate. Arrange the illustrations on the floor in your naptime area. 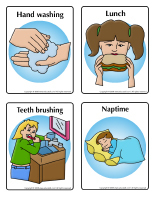 Have children pick a card to determine their naptime spot for the day or week. (Open creative coloring-Routines) Print for each child. Have children draw their favorite part of the day. 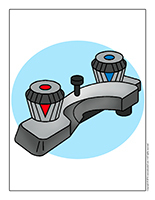 (Open coloring pages theme-Routines) Print for each child.